Stinger Fans keep your amplifiers running cool. 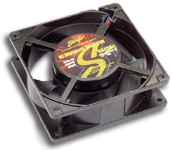 If you are running a system with multiple amplifiers, or an amplifier in a cramped space without airflow, adding a cooling fan is a good idea. Heat is an amplifier's worst enemy, and is the number one cause of an amplifier going bad. It is best to place your fans near the amplifier's heat sink so the fan can move the hot air away from your amps built-in heat sink.